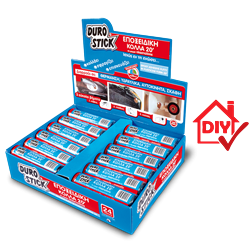 Powerful two component adhesive putty in stick form. Available in an easy to use packaging. Suitable for rapid welds, repairs and seals of similar and dissimilar materials. Quick and easy, cut, knead, weld, giving instant solutions to car radiator leaks as well as metal piping and heating radiator leaks. Necessary for plumbers, machinists and auto body shop technicians as well as every household, car or boat. The cured adhesive withstands temperatures from -30°C to +115°C, sandable and paintable. Classified R1T per EN 12004.